Home > Thoughts > Super Bikes comming to India - Are we ready to answer the big question?? Super Bikes comming to India - Are we ready to answer the big question?? After Yamaha gave us the R1 and MT01, now it's the turn of the Ducati, the Italian MotoGP giant. 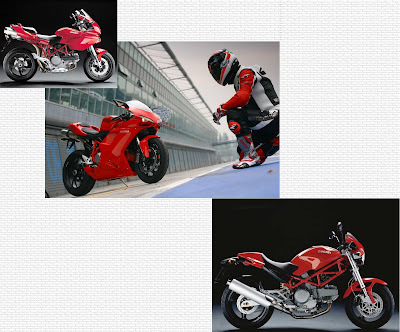 On Wednesday 7th of May, 2008 Ducati announced it's willingness to bring in it's MotoGP genere bikes to India including the Monster (bottom right), the Multistrada (top left) and the 1098 (center). In the mean while Suzuki and Honda have also announced their willingness to attack the growing Indian Performance Bike market. Kawasaki is already on it's way via Bajaj. Obviously we all are happy to have these exotic bikes available in India. We also know that these bikes would get their target customers and would also get their desired price (inspite of the insane import duties levied on the CBUs). But are we ready to answer the big question? The question that stands right infront of us that, is the Indian infrastructure ready enough to take the big chanllange that stands infront of it in the form of these bikes? More than that, is Indian Traffic sense, flexible enough to adapt itself quickly to this rapid change? In broad day light, even if you are running on the express way, you are not 100% sure that you don't have to panic brake sometime or the other, you are not sure that seeing an exotic bike pass by some insane cab driver won't try anything stupid, you are not sure that going at arround 120-130 kmph, you are not going encounter any sudden pot-hole, even if it's the express highway. Some would say, difficult traffic conditions require more able machines, but some of the conditions mentioned above can make even a Kawasaki ZX14 toss into a frezy. Now, when riding in city conditions where the Government, very aptly, has put Red Lights after every possible 100m, and when the traffic goes bumper to bumper, do we think the traffic would be patient enough to allow these bikes zoom through safely? Safety ..................... that's the word that should get the first place in the entire senario. If we are saying that these bikes are going to run only on racing circuits and the others won't be allowed to own them, we know that this is not going to happen ..................... People bought, the R1 and they are going to buy the other ones too!!! I really hope that the Indian Biking community finds the answers to the questions that lay before us ....... and we really do that real quick. yes i m agree to with your thought. Now a days, india is the most favorable market for the bikes.just because of that reason we can now get all the latest bikes which is dream for us before. I don't know about others but my wife certainly won't let me blow away 10-15 lakh on these bikes. people who bought R1 should ideally answer those questions!! On Saturday, I was returning from Delhi at arround 11:00 pm in the night. On two occasions it happened that first a guy on a Pulsar 150 and then a guy on a Thunder Bird, just for the sake of dragginf off with me, crossed me withing 1 inch at speeds of arround 80 kmph. I was at arround 65 kmph. It took me only a couple of minutes before I crossed them again and I didn't increased my speed. So, it's not only the bike, but also the sense of the biker that needs a deep thought.